Looks like spring'sfull-time warmup is just around the corner, but Florida fish are usually prettysmart about not rushing into their vernal patterns too quickly. Pretty much all of thestate's snook and a lot of the redfish, trout, ladyfish, jacks and juveniletarpon spend their winters in the warm, stable environments of coastalwaterways. Of these cold-season solaces, tidal creeks rank highly for theirnatural design, abundant habitat and available food sources. Late February to earlyMarch always sees an early wave of fish emerging and cautiously feeding on thenewly arriving pods of scaled sardines ("whitebait"), but they'llhold close to the creek mouths and dash back inside whenever a late-season coldsnap blows through the area. So, until the end of the first quarter, coastalcreeks remain a good bet for bending a rod on a variety of inshore species. Snook are the most common creekresidents, as warm water is absolutely essential to their survival when winter gripsthe flats and outer shorelines. Look for snook under docks – especially thosewith big boats that blow out deep holes under the propellers. Deep bends andundercut mangrove edges are also a good bet for linesiders. Docks of all sizes are actually thecatchall structure for most creek and canal fish. Redfish, jacks, mangrovesnapper, juvenile grouper and trout will seek shelter and feeding opportunitiesaround these structures. Elsewhere, expect to find reds,sheepshead and black drum snooping around oyster bars. Storm drains inresidential canals often sport these shell structures at their openings. Quiet pockets off the main runs willgather trout, snook and redfish – especially when windy days push pods ofbaitfish into these confines. Watch the open water in center channels for babytarpon, which roll topside to gulp air. Although pilchard schools will besteadily increasing, they can be tough to find in this transitional season.Pinfish remain available year-round, but live shrimp is a can't-miss. Best all-around tactic involves hookinga shrimp under the horn and hanging it beneath a cork. Use the tide and wind tocarry your bait into prime spots and when the cork disappears, you've got ataker. When targeting docks, go with a morestreamlined presentation. Pinch off the shrimp’s tail fins, insert your hook atthe end of the tail and thread the shrimp onto the hook. This rig is easy tocast at specific targets and keeps sheepshead and undersized snapper frompecking a head-hooked shrimp to pieces. If you need a little more weight forcasting, add a split shot just above the hook on your leader. Another option:replace the hook and split shot with a jig head. On the artificial side, ¼-ounce jigswith shad or grub tails or soft plastic jerk baits work well. Experiment withcolors to see what the fish want, but you’re usually good with chartreuse, rootbeer, gold or white. Other productive tactics includebouncing jigs in the center channels for tarpon, ladyfish and jacks; workingtopwater plugs around daybreak for trout and trolling shallow diving plugs pastdocks for snook. Here are a few pointersfor making your day successful. No different than the habitats outsidethe coastal waterways, tides play a key role in where fish will position andwhen they feed. Rising water grants access to fertile shorelines and shallowstructures, while falling tides concentrate fish in the deeper spots. Incoming tides will renew and area withfreshly oxygenated water, while the outgoing cycle pulls baitfish andcrustaceans from marshes and mangrove edges past points and bars and over deepholes where predators ambush the easy meals. Schools of finger mullet running theshoreline shallows, pinfish shining in sea grass beds, or snook chasing creekchubs against a sand bar are all activity that indicates opportunity. If thecreek is still and silent, chances are the bite will be slow until morefavorable conditions take shape. Minimizing noise is always a wiseinshore strategy, but in this scaled-down playing field, it demands evengreater consideration. Cut the big motor well before reaching your target areaand ease into range with a trolling motor, push pole, or better yet – a winddrift. If you need to stop and work a spot,carefully lower the anchor with no rattling or clanking. Same goes forretrieving an anchor. Eliminate accidental sounds between uses by laying youranchor on a towel or jacket. Don't hesitate to beachthe boat on a sand bar and hop out to approach the fish on foot. 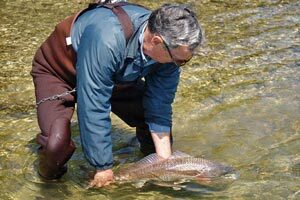 On sunny days,when visibility is high, wading can get you into casting range of fish thatwill likely shy away from a boat in the creek's narrow confines. Don't forgetyour neoprene waders. It'll be several more weeks before you'll want to step inmuch deeper than your shins.